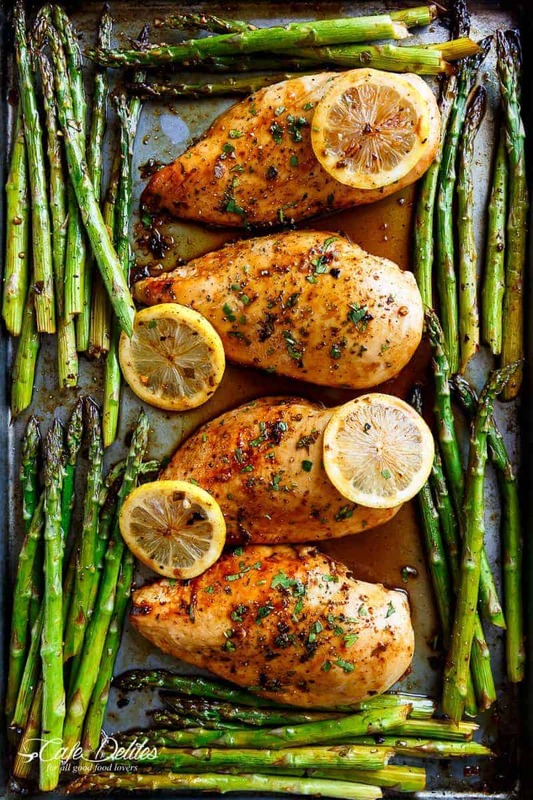 One Pan Honey Lemon Chicken Asparagus is THE ultimate sheet pan meal, perfect for meal preps or for lunch and dinner! 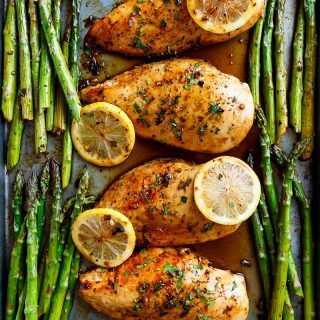 This One Pan Honey Lemon Chicken is so easy to prepare, its a matter of throwing everything onto a baking sheet and letting the oven do the work for you! There’s nothing better than only washing one pan! 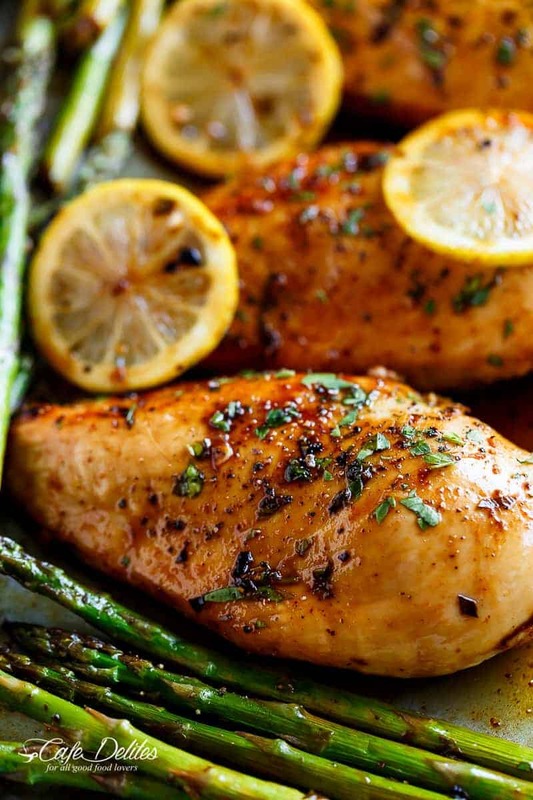 Honey Lemon Chicken is a family favourite, just like this Honey Lemon Garlic Chicken. We’ll cook any piece of chicken with Honey Lemon flavours. So, I wanted to turn that chicken recipe into a beautiful sheet pan meal; one lower in fat and perfect for meal preps to keep our New Years resolutions in tact. The perfect flavour combination = Honey > Lemon > Garlic > Soy. Combined with the dietary benefits of asparagus. Don’t like asparagus? Replace them with green beans, broccoli, zucchini, or cauliflower! Arrange oven shelf to the middle of your oven. Preheat oven 200°C | 400°F. Line a baking sheet with foil or parchment paper and spray with nonstick cooking oil spray. Arrange chicken on the sheet and season with salt; set aside. Combine together the lemon juice, honey, soy sauce, garlic, half of the parsley, salt and pepper. Pour three quarters of the honey lemon mixture over the chicken. Arrange the lemon slices over the top. Season with extra salt and pepper, if desired. Cover with foil and bake for 20 minutes, or until the chicken is cooked through. Uncover, arrange the asparagus around the chicken. Pour the remaining honey lemon mixture over the asparagus; season the asparagus with salt and pepper. 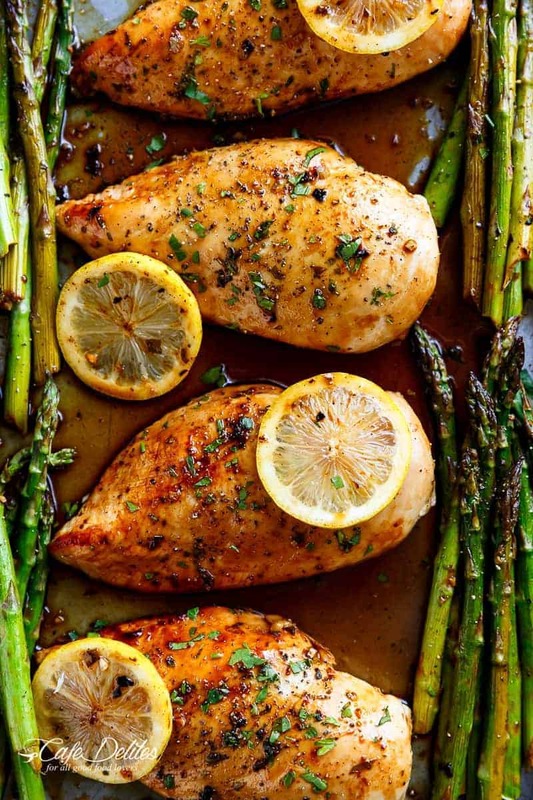 Return to the oven to grill or broil until the chicken is golden and the asparagus is cooked. Garnish with the remaining parsley. Made this for myself tonight as a part of my meal prep. Came out BEAUTIFULLY! I melted butter in the foil lined pan before adding the chicken instead of using cooking spray. It came out juicy and DELICIOUS! Used a bit more lemon juice on the asparagus also. Great recipe and easy to make! Will be making this for my boyfriend soon! Yum yum yum Karrigan! Your description made me hungry lol. Delicious and super easy! We loved it! Thanks for comment! I am so glad that you loved this. Thanks for following along with me! So delicious! And easy to make! This was very easy to make – I used green beans because that it was I had in the cupboard. I like the fact that the ingredients are those that one normally has on hand. While cooking I did notice the sauce did burn on pan and fill my house with a very unpleasant smoky/burnt smell.. does anyone have any suggestions for avoiding this? I will say, flavor is good but while eating the chicken, the chicken didn’t soak up the sauce as much as id like. In the future I am going to try to do some marinate with the same ingredients used to make the sauce and let the chicken soak up a while before cooking in hopes of a stronger flavor. Overall, recipe is not bad. Served this with rice. Can someone send me the actual recipe? I see the photo of the chicken and lemons but I can’t find the recipe!!! Thank you! I made this for supper last night and it was a hit! Very easy too. That is great to hear! I am so glad that you enjoyed it! Thank you for sharing! Does this work in a toaster oven? If so, what adjustments have to be made if any? It will still taste okay! It may alter the texture and taste but it will be good. Enjoy! I made a mistake and did not read the recipe correctly and took off the foil after 20 minutes despite the fact that the chicken still was not cooked thoroughly. I had also not broiled. Yet, it came out well. How long do you broil after putting asparagus in? I made this tonight and it was delicious, but chicken was a little dry and didn’t seem to absorb the yummy sauce – wondering if I cooked it too long? Oh no, I am sorry hun! I usually broil for about 3-5 minutes for the asparagus to warm up and get cooked to softness. How long do you cook after adding asparagus? Wanted something yummy for this new year. This was a hit the whole family loved it. Wanted to try something new this new year and this was a hit!!! My whole family loved it. Thanks for existing. Made this for dinner yesterday. Although the flavors were different than we are used to, it was very tasty. How do you prevent the sauce from burning on the pan! My fiance and I made this last night…..SOOO GOOD. Will become a staple in our house. I’m so happy to hear that Lindsay! Thank you so much for sharing your feedback! This dish is delicious, of course I added my own spices and included cubes potatoes, but great flavor. Thumbs up! I cooked my asparagus for 8 to 10 min turned out awesome! This has turned into a weekly request at our house! So easy to pull this recipe together and the ingredients are staples I already have on hand. sounds delicious… are the calories correct? Seems very high. I made this last night and my hubby absolutely LOVED it! Thank you so much for posting this recipe!! After baking for 20 mins how long do you bake with the asparagus? We have an asparagus patch and it’s in season. I’ve been looking for different ways to cook it since we eat it most every night. I made this recipe last night. Didn’t have lemons on hand so I substituted limes. It was fabulous! Hubby was raving over dinner! Looking forward to trying it with lemons. Thanks for sharing a great recipe! We made this tonight, but we didn’t have lemon juice on hand, so we substituted lemon sorbet and it was AMAZING!! This looks yummy. How long do you cook it after adding the asparagus to the dish? I never tried asparagus before, but after reading your recipe I kinda have to now. Sounds so delicious! Thank you so much for posting it, I love all your recipes! I made this last night! I made mine with green beans and served with rice. So easy and so yummy! Don’t you love just throwing everything on a pan and being able to eat a fantastic, satisfying dinner? This chicken looks so flavorful and crowd-pleasing! I made this for dinner last night and it was delicious!! My whole family liked it even my husband who isn’t a veggie person!! Very TASTY recipes here. Highly recommended.